leads him to a secret underwater town. A wonderful modern piece of brilliant Americana. Flawless acting. A tight, gripping and unique story. Solid direction. The whole film gives a sense of a storybook like atmosphere. There is a haunting reality to the film. The cinematography is beyond explanation, unless you have seen it. The brutal reality of life in run down neighborhoods, buildings, homes and dark settings of poverty, bleeds a realistic setting that plays with the imagination. The film is really hard to explain unless you have seen it. This is a poetically surreal fever dream. A mother with two kids lives in a town of Lost River. The town is falling apart and is in financial decline. Billy wishes to keep her grandmother’s house. She has no means of income. After a visit to the bank, the bank spokesperson, named Dave, lays out her reality. He offers her a card. A job. Her oldest son, named Bones, lives his life stealing and stripping cooper from rundown buildings to get money. The houses around are being knocked down and destroyed. Billy strives to make money to pay for the house. She is three months behind on rent and unless paid, the house will be destroyed. There is a jungle like atmosphere that Bones lives through. There are two gang members that Bones, is always running from. The main thug is simply known as Bully, played wonderfully by Matt Smith. Seeing him outside the role of Doctor Who is amazing. I always knew he was a talented actor and this part showcases his brilliance as a performer. There is a dystopian style concept and imagery to the film. The movie is very frightening in the realistic aspect of it. The poverty and decline of culture and all the destruction around is saddening in that, it’s not that far from the truth, or at least the concept of what could be. The premises is that there is a folk tale around the town. Several of the towns where flooded over when they released dam water, and covered the whole town, which still remains under the water. 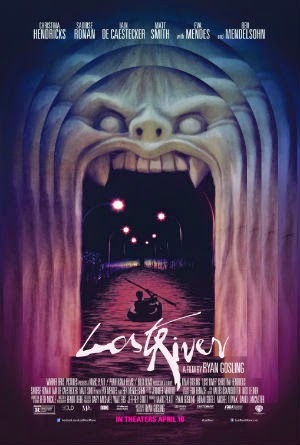 Supposedly as legend goes, the area is cursed and that is why Lost River has fallen. The one and only horror icon of cinema has a small part in this film; the one and only Barbara Steele. I grew up watching this beautiful horror goddess. From classic’s like Black Sunday to the resurrection of Dark Shadows in 1990, she is the very essence of star. This also stars a wonderful cast of young performers. The stunningly beautiful and very talented Saoirse Ronan, who plays the character of Rat. She aces the part and creates a believable and soft performance. Also starring Iain De Caestecker as Bones. I have been keeping an eye on him, he is a very talented young man and I feel he is one of the best new shining stars around, at least I think so. The chemistry between Caestecker and Ronan showcases acting brilliance. I have to mention Dave, the bank worker and night club owner and sadistic perv, played flawlessly by Ben Mendelsohn. Mendelsohn is extraordinary. His character and performance, has to be one of my new favorites in cinema. Christina Hendricks is eye opening perfection in this role as the mother character, named Billy. I also have mentioned Matt Smith, but I feel I need to mention him again. His deep and dark role is masterly. He is utterly scary in this part. This is Ryan Goslings first directing job. He also wrote this unique, fresh and somewhat fantasy laced story. Truly an original film. I have grown to like several of Ryan’s acting films and now, he has taken up the creative wonders of film making. This movie is something to remember. For his first directorial debut, unbelievable in my book. Ryan has become such a powerhouse, not only as actor, but now as visionary in direction and story. This is equals parts David Lynch and equal parts Nicolas Winding Refn, but all original. There is so much un-reality. A nightmarish simplicity, yet deep in the subconscious of the netherworld. It’s so hard to fathom and explain with words. A night club of voyeuristic fake violence. A dystopian mind screw. Karaoke, a rat named Nick, and a fetish of blood. This has all the reality of Alejandro Jodorowsky, mixed around Ingmar Bergman’s visionary expertise. I have to mention the music and soundtrack. This was equal parts masterpiece in ear listening and emotionally charged perfection. The soundtrack to this film is one of the best around. It gives such vibes that it controls you and makes you listen. Some of the best music that I have heard in a very long time. Everyone that was involved in the sound department, music department deserves accolades. The music by Johnny Jewel is pure ear candy. Pure nightmarish and dream like wonderment. Johnny Jewel is a genius. A lost feeling. A saddened emotional state of moral decay. A violent trip down the rabbit hole. Artistically weaved inside the world of horror. This movie scared me. Not in the sense of blood or monsters, but in the sense of emotions. The movie felt so different. It was like living a nightmare, that you can’t get out of.